A Limited Edition fine art print by Peter Deighan. This print brilliantly depicts without doubt the best known export of Formula 1, the world famous Ferrari and the drivers who have made this team so great over the years. Ferrari gained their first World Title as early as 1952. Since then they have gained many more world drivers titles with great names including Juan Manuel Fangio, Niki Lauda and Michael Schumacher. 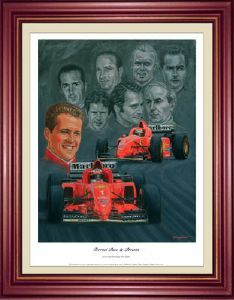 The print also incorporates, on the title line, a small portrait of the seven with their names and the dates they became world champion with Ferrari. Published in a single limited edition of 500 worldwide, each image measures 350mm x 430mm and has been individually numbered and signed by the artist. Please note, our price is for the unframed, limited edition print.